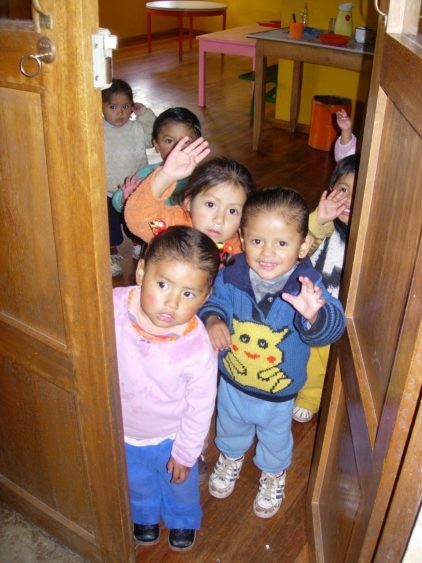 The childcare center Urpi Wasi was founded in 1990 with the purpose of providing a loving and safe environment for children who live in the slums of Cusco/Peru, most of them from single-mother families. The name “Urpi Wasi” is Quechua, the locally spoken language, which means “dovecote”. Keeping these children off the streets while their mothers work is the main task assumed by the Urpi Wasi team, who not only provide shelter and nursing, but also education, values, a balanced diet and healthcare. All of this, to develop self-confident and responsible young people. Ultimately, children are encouraged to learn a profession and break the vicious cycle of poverty. Urpi Wasi’s team has also the crucial and delicate task of selecting new children under its care. They do this by visiting children’s families personally, allowing them to see the entire picture of the children’s social and economic situation. Vacancies are assigned to those who need it most. Approximately 350 children come each day to the childcare center. The children live in the slums around Cusco. All of them come from families living in very poor circumstances. Barbara Casanova, who was born in Obersaxen/Switzerland, founded Urpi Wasi in 1990. Her goal was to create a childcare center, which keeps the children off the street while their mothers work. The center should provide them a loving and safe environment, where they are cared for and where important values are taught and lived. A balanced and healthy diet, as well as healthcare, are as important as a good education. This allows the children to develop and become self-confident and responsible young people. Ultimately, the children are encouraged to learn a profession and break the vicious cycle of poverty.